represents a trainable recurrent layer that takes a sequence of vectors and produces a sequence of vectors, each of size n.
includes options for weights and other parameters. LongShortTermMemoryLayer[n] represents a net that takes an input matrix representing a sequence of vectors and outputs a sequence of the same length. 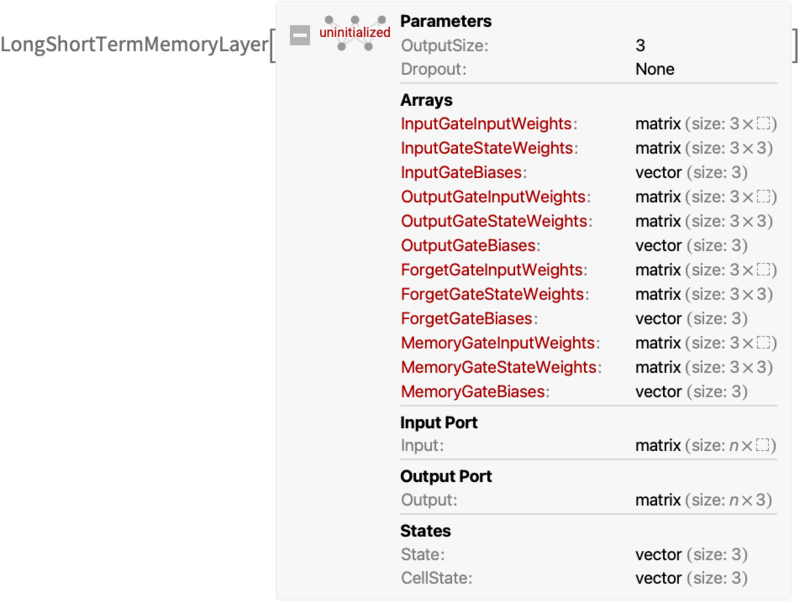 Within a NetGraph, a connection of the form src->NetPort[layer,"state"] can be used to provide the initial value of "State" or "CellState" for a LongShortTermMemoryLayer, corresponding to s0 and c0 in the recurrence relation. The default initial values are zero vectors. Within a NetGraph, a connection of the form NetPort[layer,"state"]->dst can be used to obtain the final value of "State" or "CellState" for a LongShortTermMemoryLayer, corresponding to sT and cT in the recurrence relation. NetStateObject can be used to create a net that will remember values for the state of LongShortTermMemoryLayer that update when the net is applied to inputs. In LongShortTermMemoryLayer[n,opts], initial values can be given to the trainable arrays using a rule of the form "array"->value. LongShortTermMemoryLayer[n,"Dropout"->spec] indicates that dropout regularization should be applied during training, in which units are probabilistically set to zero. Specifying "Dropout"->p uses an automatically chosen dropout method having dropout probability p.